People who knew little about Whistler were stunned to discover so much more than they ever thought, beyond the famous Mother. So, a triumph — A fine tribute to Jimmy. 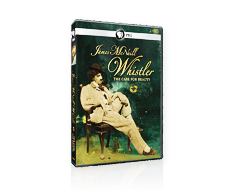 A new documentary by filmmaker Karen Thomas, “James McNeill Whistler & The Case for Beauty”, for the first time examines the life of the man and the course of his career. The one-hour documentary premiered Friday, September 12, 2014 at 9 p.m. ET on PBS stations nationwide. This intriguing video short, produced by Karen Thomas, provides a stunning examination on the process of etching. Follow renowned etcher and master print-maker, Norman Ackroyd, member of the Royal Academy of Arts in London, as he adeptly demonstrates an art form which James McNeill Whistler certainly made his own. Hear Academy Award and two-time Tony Award winning actor Kevin Kline reading from the writings of James McNeill Whistler. In 1855, at the age of 21, James McNeill Whistler left the United States for Europe to study art. He would live the rest of his life abroad, where he would achieve his fame. To find out where you can visit the art of James McNeill Whistler, check the list of galleries and institutions that house his paintings, prints, drawings, and other works. View exclusive videos from behind the scenes of the making of the “James McNeill Whistler & The Case for Beauty” on PBS.org/Arts. Karen Thomas is an award-winning producer, writer and director whose PBS documentaries include 13 prime-time productions. Whistler In the Daily News! David Hinckley, TV Critic for the New York Daily News, praises James McNeill Whistler & The Case for Beauty in his What To Watch review.